Meles Zenawi, Ethiopia’s prime minister, has died at the age of 57, state media say, after weeks of illness. Meles Zenawi died in a hospital abroad, said state media and a government spokesman, but they did not say exactly where or give details of his ailment. Speculation about his health mounted when he missed an African Union summit in Addis Ababa last month. Meles Zenawi took power as the leader of rebels that ousted communist leader Mengistu Haile Mariam in 1991. He had dominated Ethiopian public life since the 1990s, as president and then prime minister. He was austere and hardworking, with a discipline forged from years spent in the guerrilla movement – and almost never smiled. “Prime Minister Meles Zenawi passed away yesterday [Monday] evening at around midnight,” government spokesman Bereket Simon said, adding that he was “abroad” when he died, according to AFP news agency. State television said he had died after contracting a “sudden” infection. Deputy Prime Minister Hailemariam Desalegn, who is also Ethiopia’s foreign minister, will be acting head of government, state television said. 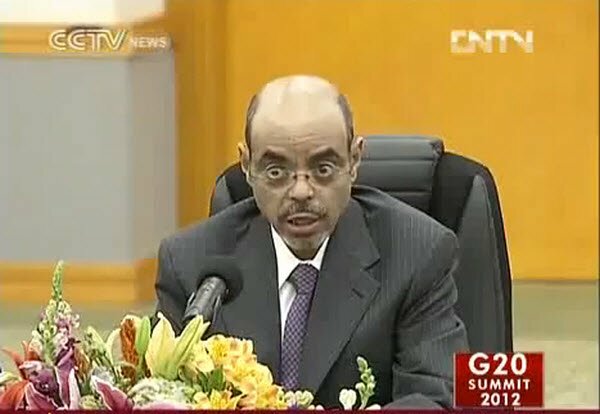 “Even if Ethiopia has been badly affected for missing its great leader, Prime Minister Meles Zenawi initiated fundamental policies and strategies which will be further strengthened,” the TV said. Meles Zenawi had not been seen in public for some eight weeks prior to his death, and was reported to have been admitted to hospital in July. But three weeks ago, the spokesman Bereket Simon said he was in “a good condition and recuperating”, and dismissed reports he was critically ill.
At the time he declined to give any details about Meles Zenawi’ whereabouts or what he was suffering from. But reports suggested Meles Zenawi was in hospital in Belgium, suffering from a stomach complaint.